Civil society in Malawi have reacted to recent xenophobic attacks to foreign nationals in South Africa,with a call to South African government to put to an end the barbaric acts and ensure foreign nationals rights are protected and that perpetrators of the act are brought to justice.The attacks have seen four Malawian nationals being killed in Durban,KwaZulu-Natal province. 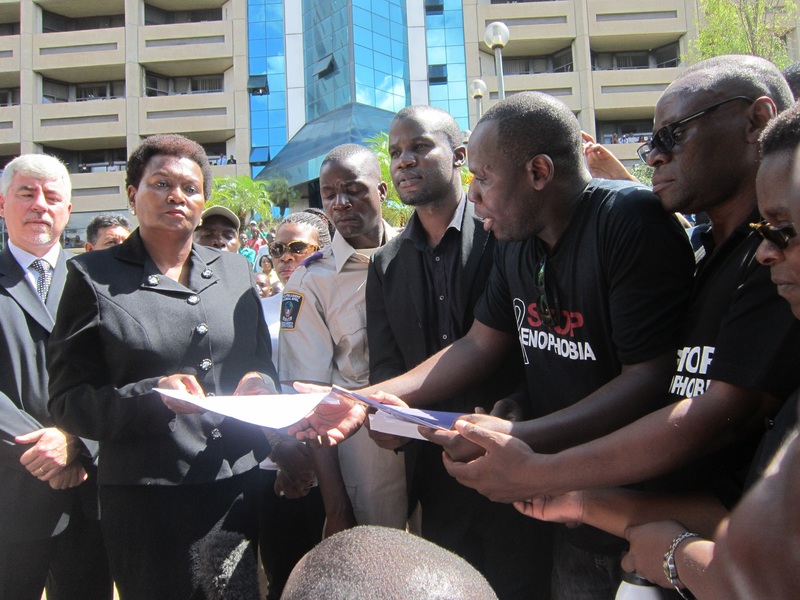 The grouping under the banner of Centre for Human Rights and Rehabilitation(CHRR) on 21 April,marched to the South African High Commission offices in the capital Lilongwe where they presented a petition to resident ambassador,Cassandra Mbuyane-Mokone. Presenting the petition to the South African High Commissioner in the country’s capital city Lilongwe on Monday morning, Executive Director of Centre for Human Rights Rehabilitation CHRR Timothy Mtambo said they need the South African Government to establish the root cause of the attacks and take appropriate measures. ‘Every human being as a right to live regardless of wherever they are, therefore the South African government has a right to protect the rights of all people and should make sure that they investigate the root causes of xenophobic attacks and bring to book all the perpetrators. 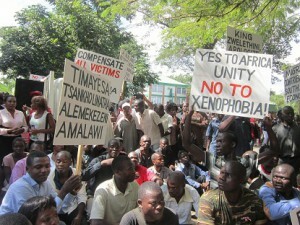 How can Africans unite if we continue killing each other mercilessly like this?’ Ranted Mtambo. Mtambo also wondered why the international mechanisms are just docile on the issue and said if the ultimatum lasts and nothing is done they will take the issue to African Union AU, Southern African Development Community SADC or even International Criminal Court ICC. Receiving the Petition the visibly shaken South African High Commissioner to Malawi,Cassandra Mbuyane-Mokone promised the protesters to forward the petition to Pretoria. “Fellow Africans,i wish to thank you for the petition and also promise that this petitition will be forwarded to Pretoria.” said Mbuyane-Mokone. 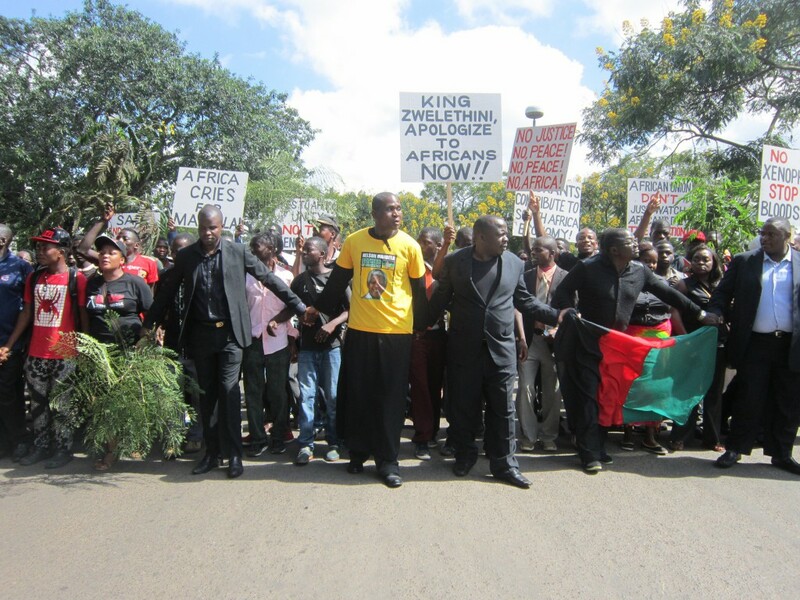 Among the protesters,were Malawi Parliament lawmakers,one of whom,Bon Kalindo said the march has shown that people are not happy with the way their countrymen are being treated in South Africa and has promised to take the issue to parliament in the next parliamentary sitting. ‘Africans are not happy and hence the march and the repatriation of their people. I will make sure that I present this issue to parliament and at least try and come up with ways how the country can create more job opportunities as most of the people who migrate to South Africa go there in search of jobs.’Kalindo said. Meanwhile,Malawi government has started repatriating its nationals who are in temporary camps.The first fleet of five buses carrying 390 people arrived on Monday,20 April while another convoy of 8 buses carrying 538 people arrived on Friday,24 April.The exercise is to continue as according to Malawi government officials,there are over 5000 Malawian people in camps waiting to be repatriated home. The xenophobic attacks by the South African youths started in port city of Durban three weeks ago following comments by the Zulu King Goodwill Zwelithini that foreigners in South Africa should go back to their countries.Atleast 8 foreign nationals have been killed since the attacks started with the brutal killing of Mozambican national,Emanuel Sithole which was captured on camera by journalists.The South African youths accuse the migrant workers of grabbing job opportunities and women from them. There are over 5 million migrant workers in South Africa mostly from Zimbabwe,Mozambique,Malawi and the Horn of Africa.Most of these people work as shop assistants and domestic workers while a fraction of them operate small scale businesses.